Lights flash. An alarm blares. Students stumble out of bed, hastily pulling on shoes and jackets before heading down the dorm stairs and out into the frigid night. Many mutter, “Not again…” Every few seconds, the building lights up against the dark sky, the alarm strobing and emitting a piercing caterwaul. At the Arlington Fire District (AFD) headquarters on Burnett Boulevard, the firefighters and paramedics on duty are awoken by their own alarm. The crackling radio transmission causes a stir in the bunkhouse, where they sleep six to a room in twin beds, ready to be up at a moment’s notice for the multiple calls that come in each night. In the kitchen below, a Vassar campus map hangs on the wall. “We know every dorm,” laughed Lieutenant Louis Cassinelli. “We have to.” When a call comes in, they hustle to their engines and race the 1.3 miles to Vassar, weaving around the cars that hastily pull over at the sound of their sirens. It’s a trip they make almost every day—or, more often, almost every night. AFD responds to just under 350 calls at Vassar each year. 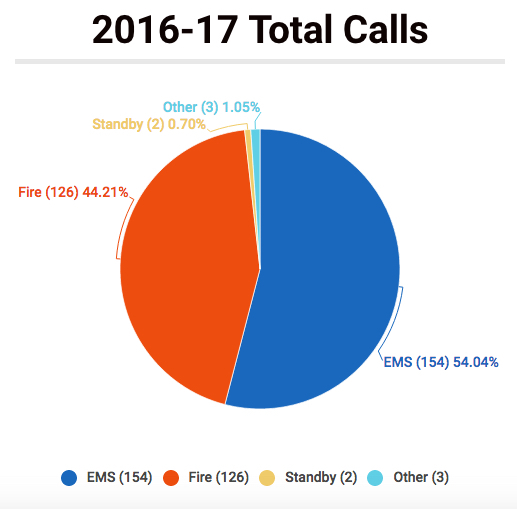 In 2016, these calls—about half fire alarms and half requests for emergency medical services (EMS)—outnumbered those of 15 of our peer liberal arts schools and the two other colleges in Poughkeepsie, Marist and Dutchess Community College (DCC), both in number and in volume of calls per student. Measured in dollars, Vassar’s use of fire district services also costs more than its peers’, taking an estimated $1 million bite out of the AFD budget last year. But unlike many of the other schools, who make annual donations or payments in lieu of taxes (PILOTs) to their local fire departments or host communities, Vassar does not regularly contribute financially to either AFD or to the Town of Poughkeepsie. In the 2016-17 school year, AFD received 347 calls from Vassar. Image by Laurel Hennen Vigil/The Miscellany News. Between the start of New Student Orientation and Nov. 7, AFD received 103 calls from Vassar. Image by Laurel Hennen Vigil/The Miscellany News. Like most nonprofits, including colleges and universities, the vast majority of Vassar’s property is tax exempt. Vassar does own several off-campus premises, together worth about $6.5 million, that it pays taxes on. Of this, a little over $40,000 goes to AFD each year. But, according to Town of Poughkeepsie Assessor Kathleen Tabor, the College’s tax-exempt property is worth far more, at nearly $185 million. “If the College was taxed on all property that is exempt, they would pay about $1,071,870 [in fire taxes alone],” explained Tabor. As a result, she added, the fire levy for Town of Poughkeepsie residents living in the Arlington Fire District would decrease from $6.21 to $5.80 per $1,000 of property—or by $103 a year for a home worth $250,000. AFD covers a 22-square mile area with a population of about 33,000. Because AFD is a fire district, rather than a municipal fire department, tax exemptions are particularly tough on its budget. In New York state, most towns and villages have fire districts, which are affiliated with the local government but are ultimately separate entities and which are funded entirely by property taxes, donations and PILOTs. For AFD, property taxes make up 97 percent of its annual budget. In cities, fire departments are still mainly funded by property taxes, but most also collect a portion of local sales taxes, which non-profits like Vassar are not exempt from. “As a taxpayer, I am fed up with the number of calls [to Vassar]. These put district residents at risk when staff and equipment must respond to nuisance calls,” local resident Doreen Tignanelli commented via email. Tignanelli is married to Chairman of the Board of the Arlington Fire Commissioners Jim Beretta and publishes a newsletter about the fire district, AFD-Reporter. Though both Vassar and AFD maintain that they have a good working relationship, it’s undeniable that serving the College takes a toll on AFD. Its firefighters and paramedics are on campus nearly every day when school is in session, according to logs of over 1,000 incident reports that The Miscellany News obtained through a Freedom of Information Law (FOIL) request. (FOIL is New York state’s version of the federal Freedom of Information Act.) During the 2016-17 school year, for example, there were only 59 days, excluding school breaks, when AFD didn’t get a call from Vassar. In 2017-18, from the first day of New Student Orientation to Nov. 7, AFD had just 16 Vassar-free days. Students here are all too familiar with the fire alarms that frequently empty entire dorms. On average, there’s one every few days, but most are not set off by actual fires. 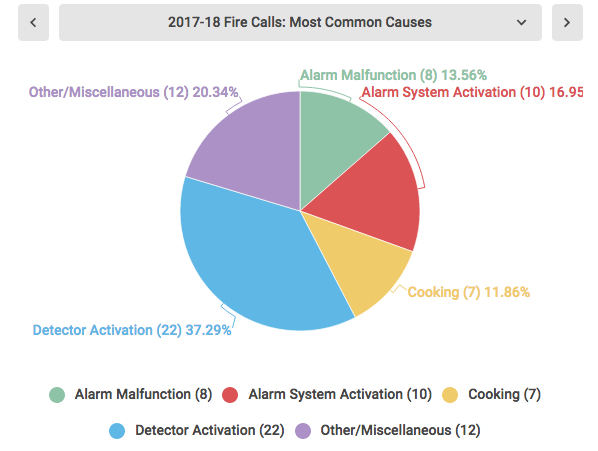 Of the 2016-17 school year’s 126 campus fire calls, 41 percent were the result of an alarm system or smoke detector being triggered by something other than flames. Another 10 percent were considered alarm malfunctions, though Vassar Director of Environmental Health and Safety Jim Kelly explained that there’s not much difference between the two labels. “The [alarm systems] located throughout campus are very sensitive, as required, and most ‘false alarms’ are really alarm activations caused by something,” Kelly said. He added that substances such as steam, hairspray, dust or smoke from cigarettes or marijuana can set off the alarms. Most of Vassar’s fire alarms are not set off by actual fires. Image by Laurel Hennen Vigil/The Miscellany News. After three students died in a dorm fire at Seton Hall University in South Orange, NJ, in 2000, neighboring New York state tightened campus fire safety regulations, mandating more sensitive alarms and sprinkler installation in all dorms. Though these strict regulations are responsible for many of Vassar’s frequent fire calls, more than a dozen current students said that they had no recollection of the College informing dorm residents about how sensitive the alarm systems are, or that using hairspray or perfume near a smoke detector could trip the alarm for their whole building. 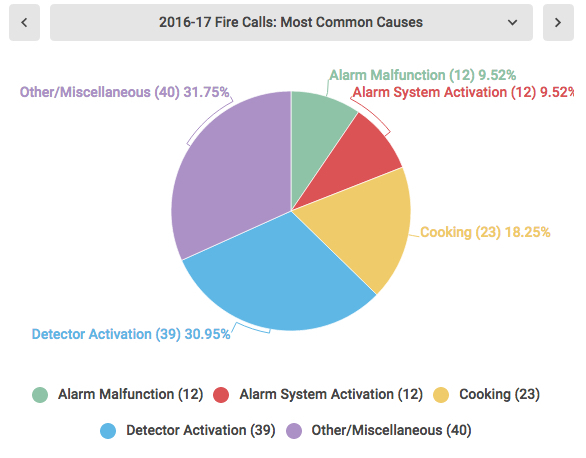 One of the most common culprits is students cooking, which accounted for 18 percent of 2016-17’s fire calls. Some of these alarms are set off by food that actually catches fire, but many are triggered by the mere presence of steam or smoke. Last school year, six of the 23 cooking-related incidents were the result of burning popcorn. “It’s being theorized that with the new meal plan, the calls might go down because [students] will be doing less cooking,” Sabo commented. Dean of the College Chris Roellke, however, maintains that this wasn’t a consideration when the meal plan was made mandatory for most students. In any case, though, between the start of the semester and Nov. 7, there have actually been more cooking fires than there were during the same periods in 2015 and 2016. 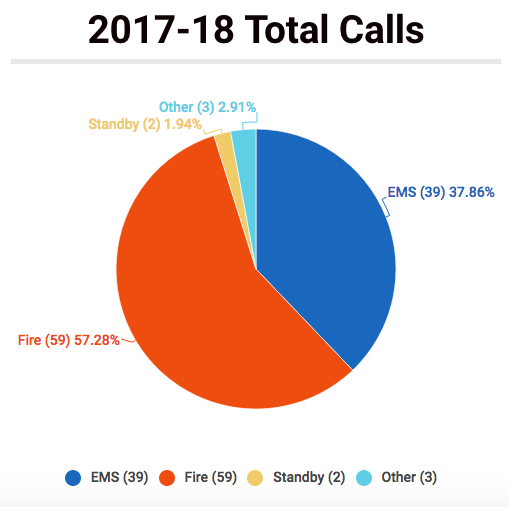 In fact, the total number of fire calls between Orientation and Nov. 7 has gone up to 59, compared to just 38 last year—an increase of 55 percent. Last school year, the average number of alarms for each dorm was 5.33. This school year, with more than a semester to go, we’ve already hit an average of 3.55 alarms per dorm. Due mostly to its size, Main usually leads the pack with an average of 14 fire calls during the past three school years, while Strong often has just one or two. Vassar’s fire alarms are spread out throughout the campus’ many buildings. Image by Laurel Hennen Vigil/The Miscellany News. Fortunately, though Vassar fire calls to AFD are up, EMS calls are down. 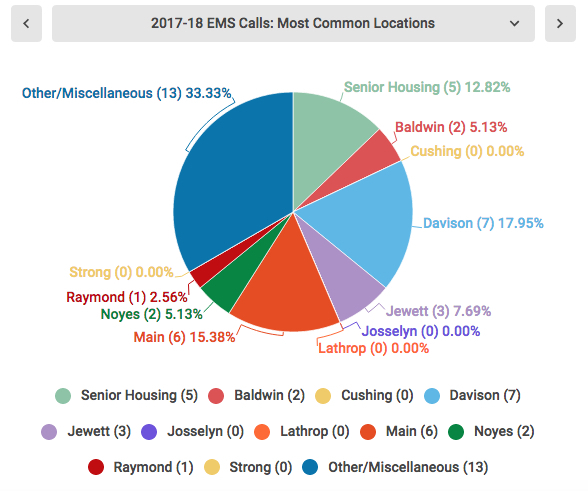 Paramedics have been dispatched to campus 39 times so far this school year, a 59 percent drop from the 62 paramedic visits during the same period last year. 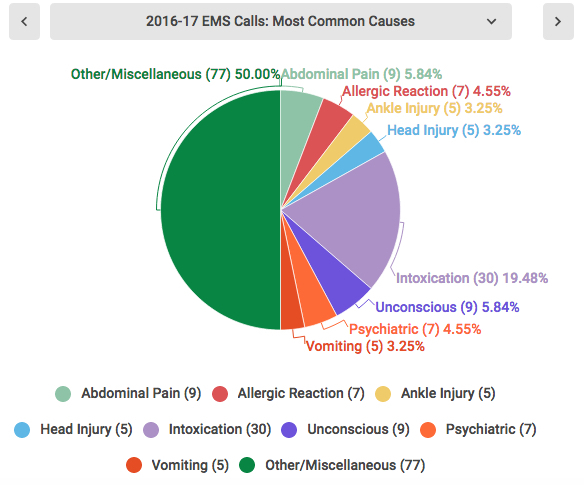 The largest category of EMS calls—nearly one in five—is for student intoxication, though an additional nine percent is for students who are vomiting or unconscious, whether from alcohol or drugs or from other factors. These percentages are largely consistent from year to year. The rest of the calls are for illness or injury. 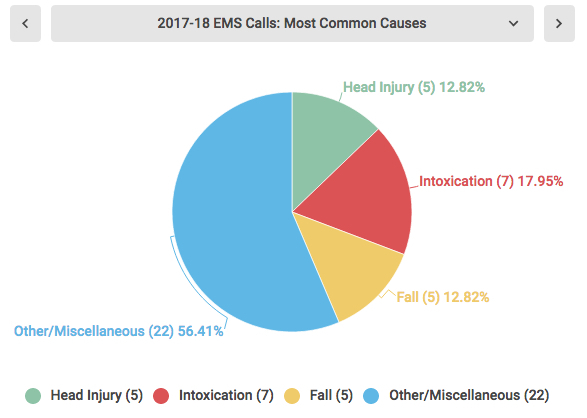 Most of Vassar’s EMS calls are due to illness or injury, but a significant portion are the result of student intoxication. Image by Laurel Hennen Vigil/The Miscellany News. AFD would likely get dozens more medical calls each year if it weren’t for the Vassar Emergency Medical Services program (VCEMS). The program, created in 1979, is made up of students, many of whom are state-certified emergency medical technicians. It operates when Vassar’s Health Services building, Baldwin Hall, is closed on weekday nights and weekends. Medical calls to Safety and Security’s Campus Response Center (CRC) during those times are routed to VCEMS. If the call is serious, the CRC will call AFD. Once they reach the patient, VCEMS members assess how dire the situation is. In some cases, they can take care of it on their own. In others, they radio back to the CRC and ask to have AFD paramedics sent in. “Every time we’re able to solve a problem on our own, even if it’s just telling someone that they’re going to be fine, it’s potentially a call that AFD won’t have to answer,” explained VCEMS Co-Captain Eric Lee ’18. VCEMS New Recruit Training Officer Naveed Nikpour ’19 added, “During big events, like Founder’s Day or Halloween, we usually get about 15 calls, and it really lightens the load on AFD for that day.” Last school year, VCEMS responded to 214 calls, though there’s some overlap with AFD calls. AFD also transports students to the hospital when needed. AFD operated its own ambulances through the end of 2016, but Gallante said the Board of Fire Commissioners decided it would be a more cost-effective solution to contract with a commercial ambulance company, and awarded that role to Mobile Life Support Services. Now, when AFD is dispatched on a medical call, so is Mobile Life. This change, unfortunately, has financially impacted students. “Mobile Life is a commercial company that is normally reimbursed through a patient’s health insurance,” explained Vassar Health Services physician’s assistant Doug Kugel, who works with VCEMS. “Prior to 2017, AFD would be responsible for the ambulance transportation. The service was funded through local government allocations and there was no cost incurred to the patient.” Now, when a Vassar student is transported to the hospital, their insurance is charged anywhere from $990 to $1,250, according to Mobile Life, depending on the level of care needed—a percentage of which the student may need to fork over themselves. 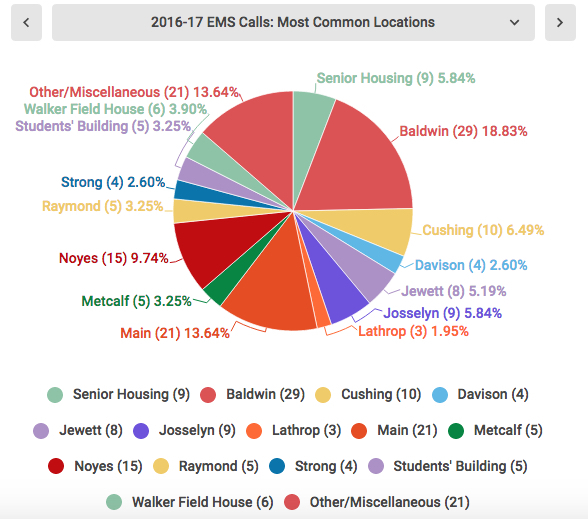 Like fire alarms, EMS calls happen all over campus. Image by Laurel Hennen Vigil/The Miscellany News. In addition to responding to fire and medical calls, AFD works with the Office of Campus Activities to advise on fire safety for large gatherings. AFD also provides standby coverage at a few Vassar events each year, most often Commencement, the Halloween party and Founder’s Day. This year, AFD worked at President Bradley’s Inauguration in September as well. These events are some of the few times that AFD is directly paid for its services at Vassar, though Gallante said that the fees just cover their costs and are not a source of revenue for the fire district. Director of Student Activities Michelle Ransom commented that there’s no flat rate for this coverage and that it varies depending on the event—though Vice President for Finance and Administration Stephen Dahnert said he believes last year’s total layout for standby fire and emergency coverage was around $8,000 to $9,000. Gallante noted that while this money is appreciated, it doesn’t even begin to cover the cost of these calls, of which there have been 12 so far in 2017, according to the AFD incident reports. The Miscellany News contacted each of the fire departments and fire districts that serve 15 of Vassar’s peer colleges: Amherst, Bowdoin, Bryn Mawr, Colby, Colgate, Connecticut, Franklin and Marshall (F&M), Middlebury, Mount Holyoke, Oberlin, Smith, Swarthmore, Wellesley, Wesleyan and Williams. The Miscellany News also spoke to Christopher Maeder, Chief of the Fairview Fire District, another Town of Poughkeepsie fire district that serves Marist College and DCC. 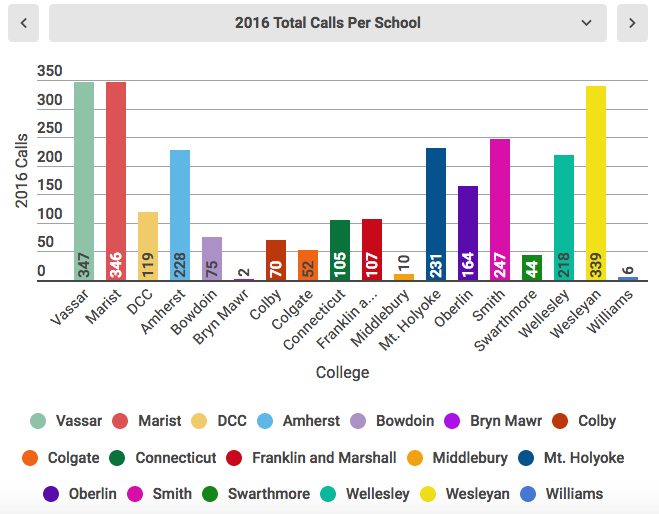 In 2016, Vassar had the highest number of calls of all 18 schools. That year, AFD responded to 347 calls here, while the other colleges averaged just 139 calls apiece. The only other schools with calls approaching the volume of Vassar’s were Marist and Wesleyan, both of which have hundreds—or, in Marist’s case, thousands—more students. 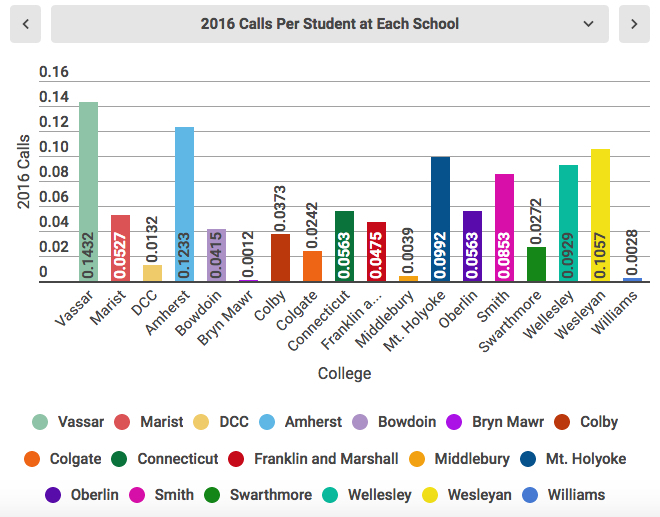 Even compared to smaller schools, Vassar had the highest rate of calls, at 0.14 for each student. That’s nearly three times the average of 0.05 calls per student the other schools logged. 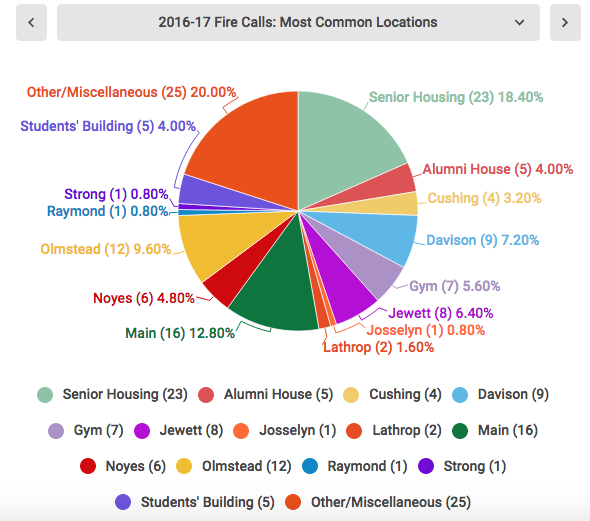 Of 18 peer and local colleges, Vassar had the highest number of calls (347) to its fire department in 2016. Image by Laurel Hennen Vigil/The Miscellany News. Of 18 peer and local colleges, Vassar had the highest ratio of calls per student in 2016. Image by Laurel Hennen Vigil/The Miscellany News. Vassar also has the highest call cost. Estimating how much each call takes out of a fire department’s budget is more guesswork than science, because of the varying time required to attend to different calls. But though it’s nowhere near a precise assessment, one of the most common call cost calculations is to divide the department’s total annual budget by its total number of calls for the year. Therefore, each call to AFD in 2016 is estimated to have cost about $2,871, which—when multiplied by Vassar’s 347 calls that year—yields an approximate total call cost of $996,211, or nearly 6 percent of AFD’s entire annual budget. Using the same calculation, the other colleges’ total call costs averaged just $214,742. For some of the other colleges served by smaller fire departments, this may comprise a slightly higher percentage of the total budget, but Vassar’s call costs are by far the highest in terms of sheer expense. 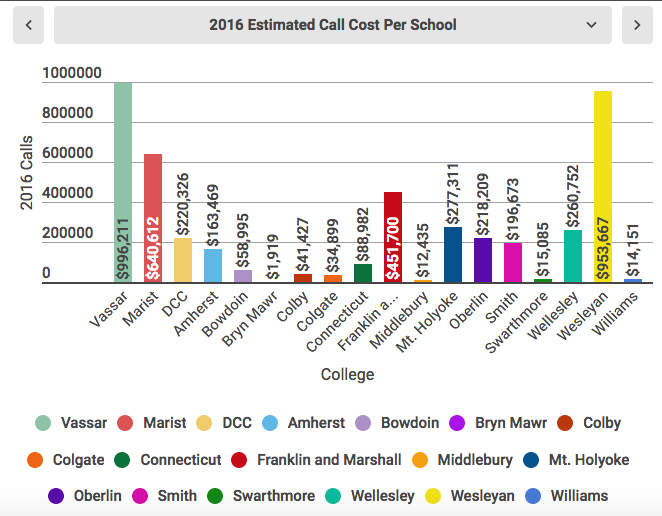 Of 18 peer and local colleges, Vassar had the highest estimated call cost in 2016. Note: Because there is no way to precisely calculate call cost, these numbers are merely meant to illustrate a rough estimate. Image by Laurel Hennen Vigil/The Miscellany News. 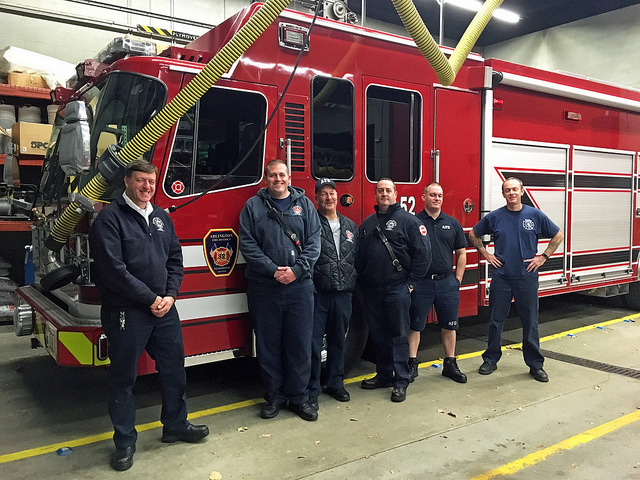 Colgate University also supports its local fire department with a robust volunteer program. Colgate students make up about 30 percent of the all-volunteer Hamilton Fire Department. A few Vassar students, including VCEMS’s Lee and Nikpour, currently volunteer with AFD or have in the recent past, but the College has no official program to facilitate this. Those who join usually hear about it from a friend who volunteers with AFD. Some fire departments, such as the Lancaster Fire Bureau, which serves F&M, levy a charge for false alarms. According to F&M Fire Coordinator Alex Grumbrecht, who used to work with the Fire Bureau, the first false alarm is free and the second at the same address costs $110. This increases until four false alarms, after which each costs $530. “This allows the [Bureau] to recoup some fees and ensures that the facility is keeping up the required [alarm] maintenance,” he said. What’s more, 13 of the 17 other colleges, including Marist, DCC, Amherst, Bowdoin, Bryn Mawr, Colby, Franklin and Marshall, Middlebury, Mount Holyoke, Oberlin, Northampton, Swarthmore and Williams, currently make annual donations or PILOTs to their fire department or to the city or town government. In some cases, portions of the contribution given to the municipality will end up in the fire department budget. These contributions generally range from $20,000 to $100,000 each year, though Marist donates $250,000 a year to the Fairview Fire District. Vassar, Wesleyan and Wellesley don’t make annual PILOTs or donations to their fire districts or host towns, but have occasionally gifted fire equipment or the funds to purchase it in the past. According to AFD, between 1995 and 2005, Vassar purchased six $10,000 Scott Air-Paks—a type of breathing apparatus—and, in 1999, bought a $19,000 thermal imaging camera for AFD. Vassar also made a $5,000 donation for storm clean-up on campus in 2000 and a contribution of $31,800 in 2008 after it received eminent domain compensation from the state for College-owned land on which the Raymond Avenue roundabouts were built. For the past nine years, however, Vassar has reportedly made no donations of any kind to AFD. And, according to the Town of Poughkeepsie Office of the Comptroller, the College currently makes no donation or PILOT to the Town. Yale University, where Bradley worked prior to coming to Vassar, makes an annual $8.2 million PILOT to the City of New Haven, though Bradley noted that she hadn’t been very involved with the official aspects of Yale-New Haven relations. No matter how the individual firefighters and paramedics feel about Vassar, whenever they answer a call on campus—be it to put out a flaming bag of popcorn, to make sure an acutely intoxicated first-year lives to see another party, to bandage up a professor who takes a tumble down a set of icy steps or simply to respond to yet another late-night fire alarm—they know when they climb back into their fire engines and drive out Vassar’s gates, they’ll undoubtedly be back. And soon. Public Safety isn’t free – ensuring all pay their fair share requires vigilance by District Officials, the Public, elected municipal officials, appointed planning officials and taxpayers. I certainly hope the new VC President Bradley will take the time to evaluate this information and agree to a PILOT with the Arlington Fire District. It’s the responsible thing to do to maintain in relationship with the Fire District and the residents of the District who bear the cost of all these calls to the college. Let’s go Vassar, be a good neighbor. was all that was needed and not even an ambulance! It was overkill! Perhaps VC Security and the AFD should agree to discuss how this type of overkill response can be avoided!